Sleep and Comfort Products Corp.
Fluffable Butterfly design with Micro-Cushion Technology ensures maximum relief from neck, shoulder, muscle and stress related pain.Thousands of pressure-relieving visco memory foam micro-cushions move and act independently to form the first and only Fluffable butterfly shaped memory foam pillow. This makes the Intense Butterfly Pillow comfortable in virtually any sleeping position. NASA technology memory foam, by responding to body heat and weight, conforms to your body, providing exceptional therapeutic cushioning. There are billions of microporoscopic Visco memory cells that function as " molecular springs" which contour to your exact body dimensions and provide superior comfort. During the course of the day, the human body accumulates and stores static electricity. This stored static charge has a negative effect on sleep. Lowering the body's static charge helps the body rid itself of tension and improves the quality of sleep. Dr. Chris Idzikowsi, one of the world's leading specialists in sleep research demonstrated that people sleeping on static-reducing Intense were better rested and required less sleep. 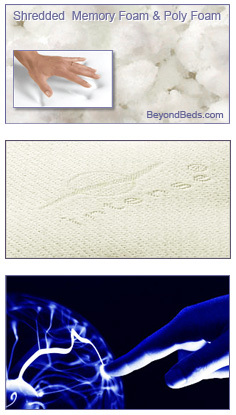 The Intense Butterfly Pillow is covered in revolutionary Intense material. The luxuriously soft Intense cover, actively repels dust, is anti-microbial and is an effective dust mite barrier. The cover material does not need to come into direct contact with your body to be effective. The cover is removable and can be machine washed or dry cleaned. Available Size: One size - Standard 22" x 18" x 6"
Five-year warranty. Made in the USA.